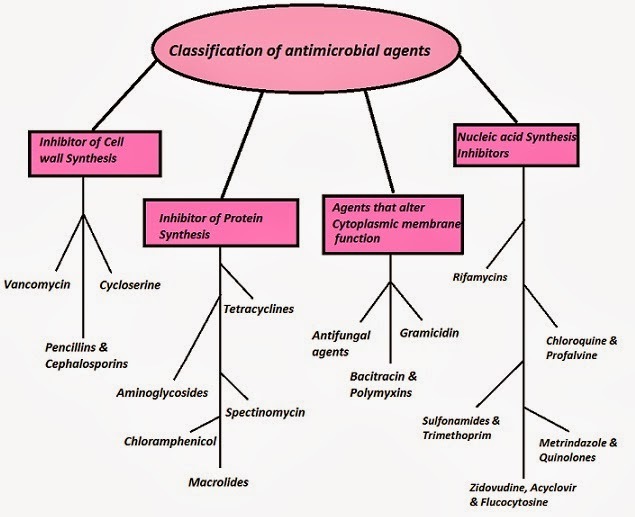 Antimicrobial agents are used for the treatment of the microbial infections in the body and the treatment is termed as chemotherapy. Paul Ehlrich is known as the father of Chemotherapy who used Arsphenamine for the treatment of Syphilis. Chemotherapy is an important perspective for the student’s GPAT preparation as lots of questions are asked from this section. Here, we are introducing the classification of antimicrobial agents on the basis of their mechanism of action. a) Pencillins, Cephalosporins, Carbepenam and Monobactam: These drugs inhibit the transpeptidase enzyme used in the bacterial cell wall synthesis. b) Vancomycin: This drug makes complex with C-terminal D-alanine residues of petisoglycan precursors. c) Cycloserine: It inhibits alanine racemase and D-alanyl-D-alanine synthetase. b) Tetrayclines: This class of drug binds with 30S ribosomes and inhibits the binding of aminoacyl-tRNA into the A site of the bacterial ribosome. c) Chloramphenicol: It binds with the peptidyltransferase enzyme on the 50S ribosome and inhibits protein synthesis. e) Azithromycin and Clarithromycin: Inhibits translocation which leads the protein synthesis inhibition. a) Antifungal drugs: Amhotericin B, Ketoconazole, Clotrimazole, Fluconazole, Miconazole and Nystatin. b) Bacitracin & Polymyxin B & E: They cause the leaking of nuclear material which leads to the cell death. c) Gramicidin: It produces aqueous pores in the cell membrane. · Zidovudine: DNA polymerase inhibition. · Acylovir: Thymidine kinase and DNA polymerase inhibition of Herpes virus. · Flucocytosine: Thymidylate synthetase inhibition. · Metrindazole: DNA strand breakage by the reduced Nitro group. · Sulfonamides: Inhibit the conversion of Pteridine & p-Amino Benzoic acid (PABA) into dihydrofolic acid. · Trimethoprim: Inhibits the conversion dihydrofolic acid into tetrahydrofolic acid.